WEST HARTFORD, CT- The Johnson & Wales Wildcats made the trip down from Providence to take on the Saint Joseph College Blue Jays in their home venue Wednesday night. The visitors were able to make short work of SJC but not without a fight from the Jays, although it was a 3 set win for J&@, 25-14, 25-9, and 25-12. Johnson and Wales pulled out an early 7-3 lead thanks to offense including an Ashley Rey service ace, and a Michelle Johnson spike. SJC pulled back within 2, but points from Nikki Balchunas, and two service aces from Catherine Bravo made the lead 11-6. Jennifer Braun tapped the ball over the net to gain a point for SJC, and Courtney Burns added a service ace, but J&W roared back with a kill from Emma Anderson, service ace from Balchunas, kill from Bravo, and a spike from Audrey Warren at the net among other points. For the Blue Jays, Michelle DiPinto got in on the scoring with a whap over, and following a pair of good defensive saves by Amanda Dondero, and a teammate, SJC picked up another point. J&W picked up a slew of points including 3 straight kills by Balchunas, a huge spike by Bravo, and a service ace by Warren to win the set. In set 2, the Wildcats scored 5 straight points thanks to two kills from Bravo, two aces from Rey, and a kill from Warren. Saint Joseph got back into it, but Warren hit two more kills, and Johnson served up an Ace to lengthen the lead along with some SJC errors. Balchunas picked up a block, and Warren struck yet again with a kill before serving up 3 aces, with a teammate’s tap over kill sandwiched between them. By the time Balchunas unleashed a smash it was 17-7. Most of Saint Joseph’s points had come through J&W errors in this set. The assault continued with Balchunas, Anderson, Erin Leahy, all getting kills, and Leahy adding an ace as well. It was a very quick set. This did not stop the Blue Jays from coming out fighting in set 3 though, The two teams fought to a 5-5 tie to open the set. Johnson and Wales exploded to a 12-6 lead though after that and kept it going. Michelle DiPinto scored for SJC with a kill, but Erin Leahy picked up a block to keep the lead at six. Jennifer Braun came up with a tap as well for SJU but Bravo smashed the ball to the corner, and Anderson had a block to make the lead 16-9. Bravo then served up two aces in a row, and after an SJC point, Megan Bollerman served up an ace as well. It wasn’t long before the score read 25-12 and J&W was celebrating their win. This was the first game of the season for Johnson and Wales and thus their first win. Saint Joseph is now 1-2 on the season. 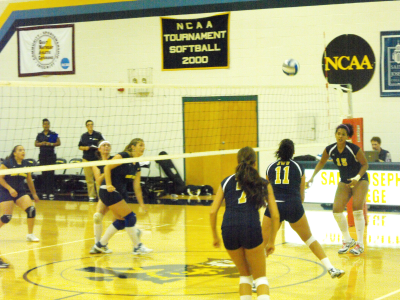 Women’s Volleyball: In a battle royale, Hartford tops Holy Cross in five sets.